Earthquakes are the most destructive natural phenomena on the earth. Unfortunately, the most historical part of the World is under seismic risk. Seismic activities result in significant damages, even collapse on the historical and monumental structures and centers. In order to evaluate and decide the vulnerability level of any building, first visual and fast nondestructive methods and preliminary evaluation are to be carried out at the beginning for preventing damages. According to this concept, an engineer or an architect can decide whether the building is safe or needs further detailed evaluation to assess its adequacy. Based on these investigations, the best rehabilitation and retrofit method can be chosen. 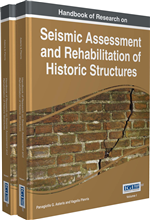 The aim of this chapter is to produce useful framework and easy applicable assumptions to not only the practicing engineer or architect but also to an ordinary person who can broadly understand and note the absence or presence of seismic-resistant features in the building and also the possibilities of further steps like seismic retrofit or rehabilitation. Earthquakes repeatedly occur natural disaster threaten most of world countries. The response and recovery efforts cannot eliminate damages as consequences of seismic disaster. Therefore, the importance of preventive measures against seismic damage or collapse risks should be reflected to the disaster protection strategy and initiatives at both local and national level. Earthquakes are only one of numerous causes of degradation and destruction of cultural and historical heritage. In general, it can be said that the constructions having greater degree of earthquake strength and resistance have survived to this day. Serious structural damages can take place for the prevailing aspect of the interaction of several reasons of damage (even not serious ones, if it is considered separately); already existing pathologies. In addition to structural damage, non-structural damages could also be unacceptable from the economic-social point of view, because into several kinds of risk and for the eventual “limitation of use”. Earthquake action can be measured by the horizontal and vertical ground actions resulting from a seismic event. The scale of these actions is dependent on the magnitude and intensity of earthquake, earthquake mechanism, the location and depth of the epicenter, the geology and layers of the earth of the seismic waves between the focus and the site, and the local site geological properties. According to Knapp (2009), monumental and historical buildings are existing constructions having important cultural and historical values (historical meanings, typological aspects and material aspects within a general architectural interest), namely having valuable testimony of ancient times, which deserve to be preserved. The concept of monumentality embraces several types of built structures: palaces, élite residences, administrative complexes and political centers; ceremonial centers and ‘temples’; fortifications and defensive compounds; and tomb constructions. Monumental structures may serve as physical manifestations of social order and collective will. Unlike most other materials and objects that archaeologists study, monumental buildings are culturally constructed places, enduring features of the landscape that actively express ideology, elicit memory and help to constitute identity. Fisher (2006) thinks that architectural complexes communicate and repro-duce certain meanings, and help to shape relationships of power and inequality between those who dwell in or use such buildings and those who visit or simply pass by them. Buildings, therefore, are more than just accumulations of materials, shapes and designs; they also serve as expressions of human intention and design, experienced both during and after their construction (Given, 2004). In their durability as well as their public setting monumental structures reveal how ancient builders combined materials, human labor and specialized knowledge to create something greater than the sum of their products. Thus they would have remained in people’s minds whether or not they were in active phases of use, renewal or re-use, however much they were remembered or forgotten at different points in time, however free or restricted access to them may have been. Major monumental buildings embody not just the earth or stone from which they were built, but the people and experiences involved in their construction: they thus hold a special place inhuman memory. Over time, such structures came to have unique histories, and typically inspired diverse if not conflicting memories, what Lefebvre (1991) called a ‘horizon of meanings’. The actual meanings of monumental structures are very hard to pin down, and archaeologists must always situate them in their cultural or historical context, allowing for the possibility of multiple meanings. Seismic Vulnerability: Seismic vulnerability means that inability of historical and monumental buildings to withstand the effects of seismic forces. The concept of vulnerability pertains to a system of basic concepts involved in risk analysis. Damage Diagnosis: Searching buildings for damages by non-destructive materials and diagnostics of construction elements using different technologies. The survey of the existing structural or nonstructural problems in the building. Preliminary Assessment: It aims to decide about the need to continue (or not) the investigations and about the eventual need for urgent measures to be undertaken, related, namely, to the continuation of the use of the building, or to the installation of temporary supports. Retrofit: The process of strengthening older buildings in order to make them earthquake resistant keeping cultural, historical and architectural values. Structural Monitoring: It is used to assess the time-dependent variation of quantities related to structural behavior. Rehabilitation: It is the result of the need to improve existing buildings for new conditions of use, and also of the recognition of the importance of conservation of the architectural heritage. Rehabilitation of heritage buildings is a way of sustainable development and also an act of culture. Monumental Structures: A monumental structure is a type of structure that was explicitly created to commemorate a person or important event, or which has become important to a social group as a part of their remembrance of historic times or cultural heritage, or as an example of historic architecture. Intervention: Changing heritage building existing characteristics by restoration techniques.